Because the battery life of action cameras is limited, you should always have extra batteries. You do not have to buy the a particular brand: other brands such as Wasabi and Smatree work as well and are cheaper. This Smatree Kit comes with a 3-bay charger, 2 batteries, and a cable. A good case is a really important camera accessory when you are traveling. Smatree produces a great case called the SmaCase which can fit a Go Pro Hero 4 camera, tripod mounts, quick release mounts, thumbscrews, SD card, cable, and a GoPole Grenade grip. A grip. A handgrip is necessary if you are are in precarious or fast-moving situations or taking shots at really edgy angles. For watersports, the floating handgrip called the Bobber is recommended. Red Underwater filter for water activities – it prevents the murky look that underwater images can come with. Anti-Fog Strips are also necessary if you are going to be in or around water – or just walking/hiking/biking in the rain. The GoPro frame is great for sounds like wind, waves, birdsong or just narrating your experience. The audio you get from this device is super clear. A camera extender – or really a selfie stick! But of course! 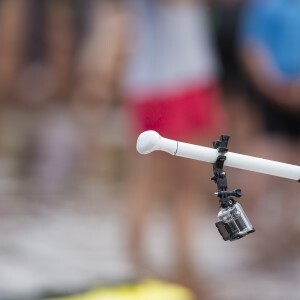 You don’t want to lose your Action Camera because it has not been fastened properly on its mount or your bike handlebar, so a safety leash is essential. These are great camera accessories to consider when you are traveling with your action camera. If you are planning on specific activities or places to photograph, check out the camera accessories that are available just for these uses. Thinking of going abroad to learn English? Since 1998, TALK has brought students from all corners of the world together to the USA to learn English. Our vision is about a world where communication, understanding, co-operation and respect exist between people of all countries and cultures. At TALK, we believe the best way to learn English is to be fully immersed in American culture both inside and outside of the classroom. Learn More About TALK.